Dirty Projectors have steadily cranked out the tunes since forming in 2002. About to Die is a quick follow up to July’s full length album, Swing Lo Magellan. The first (and title) track on the EP should sound familiar; it was tucked away in the band’s last release. 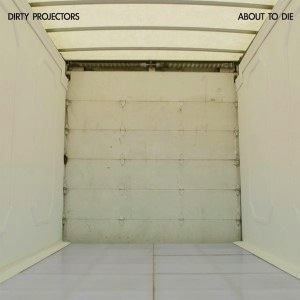 “About to Die” presents a clash of quirky percussive rhythms and a sing-song chorus. The intermittent spoken word carries the song along the longest track on the EP. DP abruptly changes gears with “While You’re Here.” It’s as if we really have died and ended up in heaven. Soothing strings softly sweep lead singer Dave Longstreth’s lyrics up and into our ears in this memorial track for the late Gerard Smith of TV on the Radio. Cooing vocals continue on “Here Til It Says I’m Not,” but they toughen up a bit on “Simple Request.” We’re glad this death-filled album has enough kooky cheer to get us through.